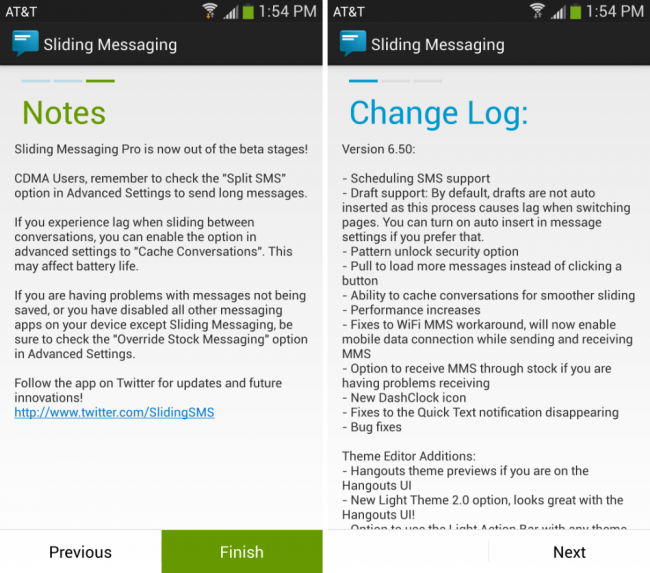 Over the weekend, Sliding Messaging, a replacement SMS/MMS application that we have discussed on numerous occasions, finally lost its beta tag. Reaching version 6.50, the developer feels that most of the features and bugs have been added/fixed, so the app is finally ready to be called 100% ready. Included in the newest update is large list of new features, ones that we will list out from the changelog down below. If you have yet to try this app out or gave it a whirl back when it was first launched, definitely give it a try now. Months of work have gone into making it a solid texting app replacement. The developer states that the price will be increasing up from $0.99, so grab it for cheap while you still can.